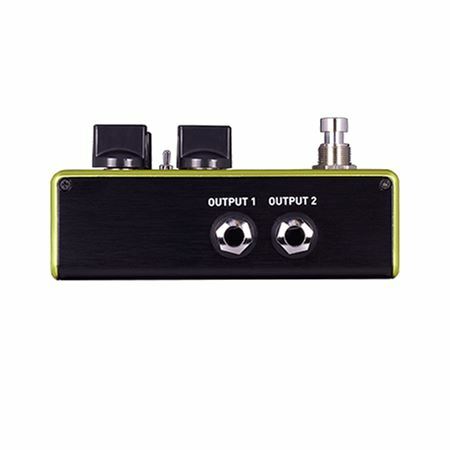 Shop Source Audio One Series SA243 Vertigo Tremolo Pedal from AMS with 0% Interest Payment Plans and Free Shipping. 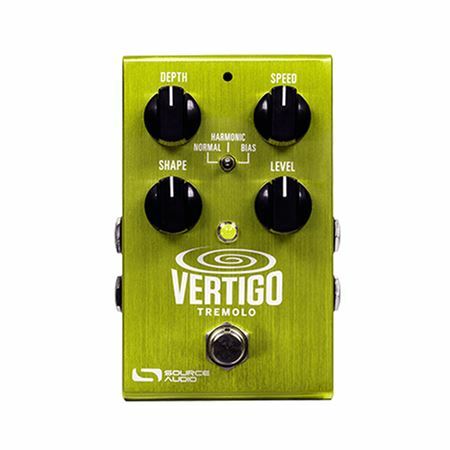 The Vertigo offers three distinct tremolo effects which are Normal, Harmonic and Bias. Discover the true spiraling and hypnotic potential of advanced stereo tremolo. 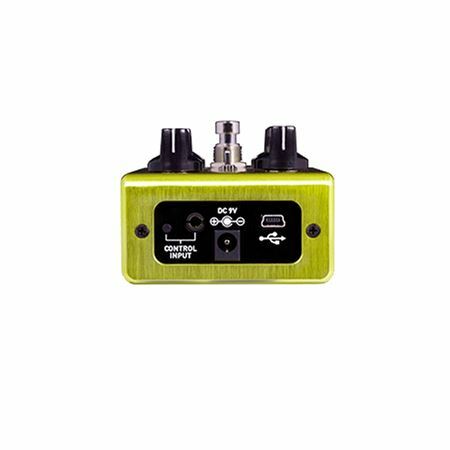 Stereo Input and Output Jacks — Create deep and wide stereo modulation. Expression Control — Compatible with Source Audio expression pedals and the Hot Hand 3 Universal Wireless Effects Controller. Normal tremolo delivers a divine renewal of the thumping “opto trem” amplitude modulation found in vintage Blackface Fenders. Harmonic revives the haunting sway of the Fender Super’s “Vibrato” effect from the early 60s — this vintage tremolo ping-pongs between a low and high frequency boost, creating a swinging phaser-ish effect. Finally, the sweetly overdriven Bias tremolo creates the swampy “bias wiggle” of early tube bias modulation. The Vertigo takes the tonal possibilities a step further with its Shape knob, which allows users to morph the LFO wave shape from square, to sine or opto, to saw tooth. Out of the box, the Vertigo Tremolo offers tremendous tonal range, but beneath the surface resides a treasure chest of swirling effect possibilities. Connect the Vertigo to the Neuro Mobile App (a free download for Android or iOS devices) and access Source Audio’s free library of progressive tremolo patterns and hybrid modulation effects - each can be uploaded directly to the pedal. The Neuro App also offers an additional set of adjustable parameters including parametric EQ, wet/dry mix, tap tempo, and stereo separation. Plus, every One Series pedal is fully MIDI compatible when coupled with the Neuro Hub (formerly Soundblox Hub), giving you the power to save up to 128 presets. Connect the Vertigo Tremolo to the Nuero Mobile App (a free download for iOS or Android) and explore the full power of effect downloading, customization, and sharing that comes with every Ones Series pedal. Free Effect Downloads — Choose from our vast collection additional tremolo algorithms. Customize Effects — Tweak an extensive range of additional parameters. Download Presets — Explore Source Audio’s ever-expanding library of free effect presets. The Vertigo also features full MIDI capability and simplicity when coupled with the Neuro Hub. Multi Pedal Scene Saving — Connect up to five One Series and Soundblox 2 pedals to the Neuro Hub and create 128 multi pedal scenes, recallable via MIDI program change messages. External Expression Control — Connect the Neuro Hub to any Source Audio expression pedal, Hot Hand 3 Wireless Effects Controller or third party TRS (Tip Hot) expression pedals and manually control effect modulation or assign expression control to any adjustable parameter. MIDI Clock — Sync your tremolo with external MIDI clock messages. Includes: 1/8” to 1/4” cable for Neuro Mobile App connection. USB port: Connects to Mac or Windows PC for firmware updates and the forthcoming in-depth effects editing software. Build: Brushed anodized aluminum housing. I love this pedal because of the user friendly simplicity but the functions go much deeper with the app that you can download for this pedal ! It’s honest tone sounds like it’s from a fender type amp very classic type sounds from this pedal. No off coloration or unwanted noise and it’s built solid. 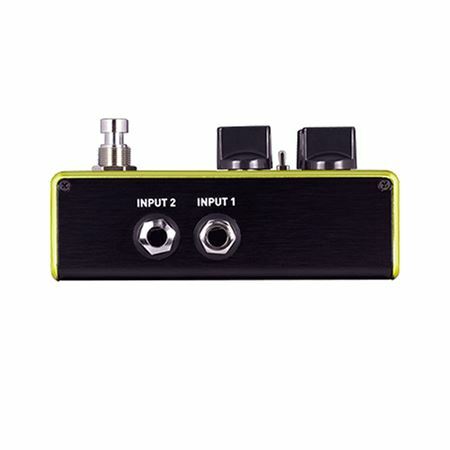 Long and short is this is a great pedal... grab one and give it a try for yourself ! An incredibly accurate take on actual amp tremolos. You get 3 excellent types of tremolo and the ability to shape each of them to your ears desires.